We begin the story with a young narrator reading a book- 6 Babo Ondals - (KOREAN FOLK TALE) Once upon a time, there were three pairs of village idiots (Haha,Gary), (Dumb and dumber - Yoo Jae Suk, Kwang Soo), (Kim Jong Kook, Ji Suk Jin). They gathered at the field to hear the royal decrees read out by PD Jo. Faraway, at the palace there were three princesses ( Sa-yeon, Ji Hyo UEE). King Go read out the fault of each princess - Sa-Yeon for having a big appetite, Ji Hyo for being 'mung' and UEE for being pretty. Their punishment is to train the idiots and marry one of them. Sa-Yeon, the eldest princess set off to look for her husband first followed by Ji Hyo and UEE. Song Ji Hyo found the dumb and dumber team but the pair was aloof when they were approached. They even placed their hands in the pockets in front of Ji Hyo. This does not last long, because they were spotted by Sa-Yeon and the pair immediately grab hold of Ji Hyo. Memories from the previous Queen Race episode appeared in their minds. When approached by Sa-Yeon, the dumb and dumber claimed that they are not foolish and Stated that the idiots are at the other side. Suk Jin and Jong Kook spotted Sa-Yeon at a distance and they immediately hide behind the tree. However, Sa-Yeon saw them hiding behind the tree and she marched towards them declaring that she is joining their team. Ji Hyo came by and they cried out to her but to no avail. Therefore, Sa-Yeon, Suk Jin and Jong kook is the Orange team. Ji Hyo met Haha and Gary and they formed the blue team. The last of all, UEE appeared in front of the dumb and dumber team. Obviously, they were delighted to see UEE and they chanted feel, touch, cross. With that, they formed the Green team. At the car, the green team had lots of fun as UEE could'nt help but giggle at the sight of Kwang Soo in his hair wig. She even said that he looked scary at this angle. The dumb and dumber chirped about how happy they were when they saw UEE. They even mentioned that they should dress well if they know UEE is coming. Their next mission is at the spa and the objectives is to train the idiots in the heated swimming pool. The princesses need to answer the questions correctly, otherwise their teammates will suffer the punishment. What is the punishment? That is being squash by a jet of water. Ji Hyo gets the first question about scocer wrong and the Blue team suffered the punishment. Subsequently, the princesses gave the wrong answers and their teammates suffered. Wait a minute, is'nt that Kookinator! Wow, that was impressive, how could he maintained that pose when he was squashed by the water? Amazing! Ji Hyo seemed to enjoyed looking at her teammates suffer the punishment by the water canon. We can see the guys looked deadpenned while being punished repeatedly as they shivered in the cold. The princesses shouted out funny answers such as foreve field had me brusted out laughing. Finally, all the team scored a point each. The boys at the back started to complained and Jae Suk even shouted, 'save me!' Gary was asking the ladies to hurry up until Ji Hyo complimented that he look good in the damp state. He surely looked flattered by her comments. The Pd change the rule and this time round, it was the boys turn to answer the questions and they were confident about the topic on sports. However, the question is about shoes and the guys blunt out everything they know about shoes and it was the ladies turn to shake their heads in disappointment. Finally, Sa-Yeon yelled out the answer, "wedge heels." Suk Jin said, " I had never heard of this before." Jae Suk added that everything to them is shoes. UEE replied that everything to them are soccer. The green team eventually scored two points and set off to the next mission. At the car, UEE compliment her teammate but when asked who is the most impressive, she chooses Jae Suk. So-Yeon on the other hand joke about herself in the car with Jong Kook and Suk Jin. At the next mission, they were separated into two teams. 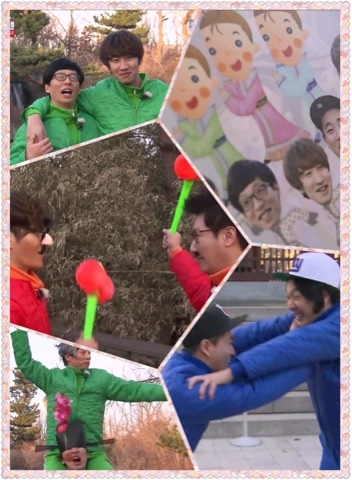 The first team consisted of the married guys (Haha, Jae Suk and Suk Jin) and their mission is to carry their princess and squat five times before doing a limbo. Haha had difficulty in carry Ji Hyo and failed in his attempt. Poor Suk Jim have to carry So-Yeon, needless to say, he also failed the mission. In order to save face, Jae Suk stepped out to carry So-Yeon. Unfortunately, he failed in his attempt too. At the behind the scene snapshot, we can see So-Yeon and Suk Jin did an arm wrestling and So-Yeon won. that explains why the guys failed to carry her. At the other side of the game, we are in for a great treat. The pepero game they were about to play is going to be spectacular. They have to bit off the pepero using their mouth and they must eat until the pepero left with 1cm. Kwang Soo was blushing when he heard that he is going the play the game with UEE. It was so funny to see Kwang Soo looked so embarrass while UEE bite off the other end of the pepero. Omo!! Look at Kim Jong Kook doing the pepero game with So-Yeon and the fan girl in me yelled, "No way!" Definitely make me envy of her good fortune. Haha. Kwang Soo being the trouble maker stepped on the pepero that Jong Kook dropped on the floor and they had to do it again. The highlight of this game is the ex-Monday couple! They look so sweet when they were playing the game and at one point, their lips touched! Jong Kook and So-Yeon completed their mission first and ran back. The other two groups completed their mission shortly after and joined the rest of the team. Kwang Soo carried UEE and attempted to do the limbo. It was evident that he had so much difficulty. I wondered is Kwang Soo that weak or UEE is too heavy. Jong Kook had no problem lifting So-Yeon up but he had much difficulties in doing the limbo while carrying So-Yeon. I can see Jong Kook rubbing his back earlier while he was seated down with the others. I felt sorry for him as So-Yeon is really big. Gary on the other hand completed his mission easily since he is carrying Ji Hyo. Another Monday couple moment. Hurray! The final mission took place in the boxing area. Jong Kook and Gary were seen practicing boxing on a sandbag. That was awesome! The rule of this game is that the idiots have to be blindfolded while the princess ride on their back to fight against another team. The orange team and Green team compete against each other first, the winning team will compete against the blue team. The first match was between The Orange team and the Blue team. So-Yeon was no match for UEE who managed to tear off So-Yeon nametag. Next, we have Jong Kook and So-Yeon V.S Kwang Soo and UEE. Kwang sneakily attempted to kick Jong Kook when he was blindfolded. Instead of attacking Jong Kook, Kwang Soo was wrestled down first. This is what you'll get for challenging Spartakook. Haha. Eventually, the orange team was eliminated by the Blue Team. For the final match, the green team Vs the Blue team. Ji Hyo won against UEE in the first round when she torn off UEE nametag at an amazing speed. However, UEE fought back during the second round and won against Ji Hyo. The Blue team was declared the winner in this princess and idiots race. The prize for the race is a pair of couple rings. When asked to choose a teammate to put on the ring. Kwang Soo was choosen by UEE and they flashed the couple ring with a mega smile. The story ended with the couple broke up after this and the little girl cried out to her mum that the story was weird. The beginning of the 'fairy tale' story was funny. The little girl was cute too. The idiots pairings and the three princesses got me laughing out loud. especially, the dumb and dumber pair. Girrafe Kwang Soo was so hilarious with that outfit and the wig. He is definitely a natural comedian. He surprisingly look good with UEE and he did a great job, especially when paired up with UEE. The limbo game was funny too. However, I felt sorry for the guys, in particular Kim Jong Kook. My heartache for him when he carried So-Yeon and his backache. ( I saw him rubbing his back when seated down) There were many ex-Monday couple moments and I like it.